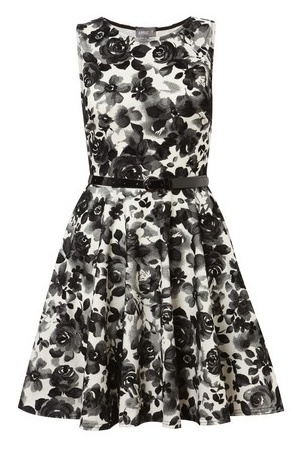 There was a beautiful black and white rose dress from Milly that I recall seeing back in early January... I can't find it now. Maybe it's all sold out, or I imagined it. Okay, I didn't imagine it. I can find this one from Milly tho, that's got the same pattern. The dress is a bit different tho. But it's still lovely. And expensive. Well, it was expensive. It's on sale for only £150! Bargainus! Okay, yeah that's still expensive, altho it was like £250. Find it here. Like the look, but hate the price tag? I found a few much cheaper options that I thought I'd share! The first is from Apricot for only £27 here. This one is only £22.99 from New Look here. 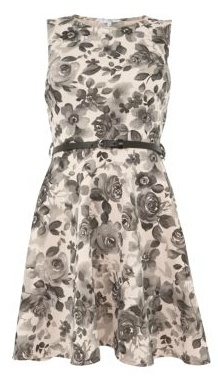 I also saw a dress in a completely similiar style in Primark for £13.00. Sadly I don't have a pic of it as I'm technologically behind the times. So is Primark, they don't have a website! My phone doesn't have a camera or the internet. ¬_¬ So you'll have to take my word for it. It was really cute!